Keep Your Break Room and Board Room Well Fruitified! OFFICES ARE GETTING HEALTHY. Across the nation, corporate wellness programs are being encouraged and incentivized. In its worksite wellness manual, the Texas Department of State Health Services lists a variety of measures that businesses can take to improve the fitness of their workforce, including health fairs, regular meetings of weight loss groups, and “healthy food”. That’s where ORCHARD At The OFFICE comes in! A CULTURE OF WELLNESS GETS TANGIBLE RESULTS. A wealth of accumulated data demonstrates the seemingly obvious: a staff that eats better, works better. “If you’re serious about achieving top workplace performance, making intelligent decisions about food is essential,” wrote Ron Friedman in the October 2014 edition of the Harvard Business Review. He goes on to make the point about the necessity of making healthy snacking easier to achieve than unhealthy snacking, citing a July 2014 dissertation by the British Journal of Health Psychology which states, quote, “fruit and vegetables consumption predicted greater eudaemonic well-being, curiosity, and creativity at the between- and within-person levels.” Eudaemonic is defined as “conducive to happiness”, so what this study confirmed is that people are happier when they eat fresh fruit! The concomitant benefits, especially creativity, nurture the kind of innovation that drives the American workplace. 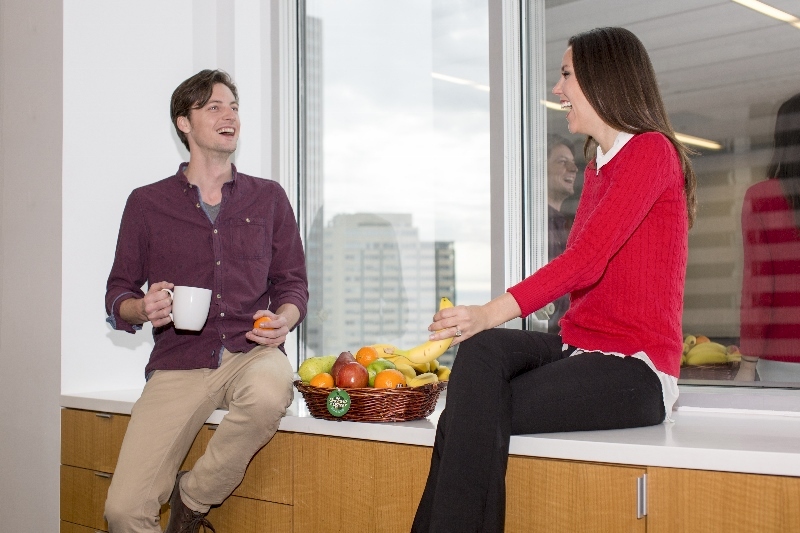 JOIN THE HEALTHY OFFICE MOVEMENT. ORCHARD At The OFFICE's office fruit delivery is the simplest, most effective way to provide healthy snack alternatives to your business. We hand-select premium-quality produce, customize the order, and deliver it directly to your break room or board room. "ORCHARD At The OFFICE has been a huge success! The employees appreciate the fresh fruit," says the HR Director of Texans Credit Union. 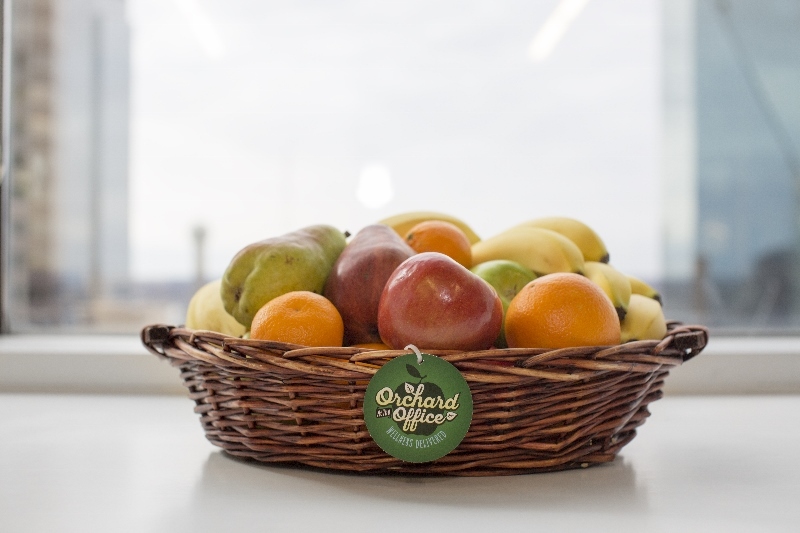 In addition to having ORCHARD At The OFFICE supply healthy snacks for all their branches, "we maintain the healthy initiative by bringing in these wonderful baskets at all of our events and meetings." GET THE MOST OUT OF YOUR WELLNESS BUDGET. If you're part of a wellness committee, or know someone tasked with any initiative designed to promote fitness in the workplace, get in touch! Whether you're an office of ten or fewer, or a big business with over a thousand staffers, we've got the right solution for you, from our Premium Mini baskets to our Fortune 600 Special. Our helpful and knowledgeable staff will take care of any display needs you have and answer any questions. All you have to do is call! You can reach us at 972.295.9091 and we'll help you create a healthy office plan that suits your tastes. You can get started here or contact us with any questions.